The County of Leicestershire has long been associated with farming and engineering, agriculturist Robert Bakewell farmed just outside Loughborough, he was cited by Darwin in his Origin of the Species for his work in selective breeding, and it was in John Taylor's Bell Foundry in Loughbororgh that Great Paul, Britain's the largest cast bell, that now resides in St Paul's Cathedral was made. Leicestershire was also at the centre of the Framework Knitting industry. In this thriving and important cottage industry, 33,000 knitting frames were in use, over 11,000 of the frames were in Leicestershire. However, the villages in which John Toon spent his life had no engineering works, and he was too many generations away from his land owning ancestors to reap the benefits inherited money could bring. The small villages of Thringstone, Whitwick, Colorton and Swannington lie just over twelve miles from Leicester itself, and form four corners of a square that border a number of green fields that covered another source of wealth for the county, the coalmine. Apart from the growth of these villages, this area looks much as it did when the 17th century faded into the 18th. Whitwick, pronounced Whitick, can be found in the Domesday Book where it is written as Witewic, a name that is probably derived from the Anglo Saxon word hwita meaning white and wic meaning farm. 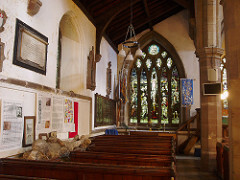 It has been suggested that Whitwick was held by the Earls of Mercia, namely Leofric, whose wife we know as Lady Godiva, it is known that the couple held land in Leicestershire. After the conquest of England, Whitwick was held by Hugh de Greadmesnil who arrived in the country with the conqueror. By the 12th century there was a motte and bailey castle at Whitwick. This castle was held by the Earls of Leicester, however it was in ruins by 1427 with its foundations and north wall still visible in John’s time. In 1320 the castle was the scene of a skirmish, between Sir John Talbot and Henry Beaumont regarding the rights to the castle. As time passed, the lands around Whitwick descended through generations of different families and by John's time much of the land, that included the castle ruins was in the hands of landowner Joseph Almond Cropper. For John, and the other inhabitants of Whitwick, there was no opportunity to gain employment in engineering works, neither was there the chance to better themselves with a decent education. By the time John had established his family in this small area of Leicestershire, many had taken the opportunity to earn money by working for themselves with equipment they owned themselves, even though they were controlled by those who purchased their goods, they at least, by working hard, could make something of their lives. 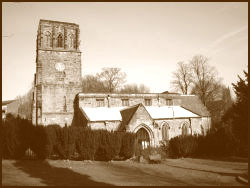 In 1799, when James and Ann brought their baby to be baptised at the font of St John the Baptist Church in Whitwick, it was Francis Harris, the villages longest serving vicar, (fifty one years and six months,) who sprinkled holy water on John’s head, the water may have been taken from the two ancient streams that joined nearby. St John’s the Baptist Church is a 14th century structure standing on the site of an Anglo Saxon place of worship. Along the north wall is the tomb of the aforementioned Sir John Talbot who bought about the ruin of Whitwicks castle. John appears to be the youngest of three children, of his older brother James and sister Mary nothing is known. His paternal grandparents do not appear in Whitwick and probably hale from Colorton or Thringstone, his mother, Anne Underwood’s parents may have been Framework knitters in Whitwick and it is with them that the young John may have spent parts of his childhood, however nothing is known of John’s life before his marriage and therefore his story begins here. 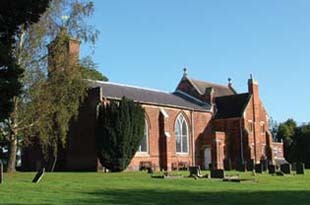 John marriage to Elizabeth Preston took place in the parish church of Coleorton on the 28th day of May 1822, John was twenty three years old. It was not until five years after the marriage that the couple are recorded as having children. It is unlikely that there were no children born to the couple in that time, but there are no birth, baptisms or death records of any children before this date to prove it. However, Elizabeth’s pregnancy in the 1826 resulted in the birth of twin boys, John and William. Elizabeth gave birth at regular intervals over the next twenty three years to seven more children, Thomas my ancestor born in 1827, James in 1829, Henry in 1832, Mary in 1836, Elizabeth in 1838, Jane in 1841 and Alpheus in 1843. The censuses show that for over thirty years John Toon, to support his family, was a Hawker. The 1841 census doesn't go into detail as to what he was selling, however the following two census do, John was selling hardware, which I take to meaning pots, pans, tools and plates. Hawking is a trade that is often associated with the gypsy or traveller, a person moving from place to place selling their wares from a basket or cart. Unlike a traveller, the hawker worked within a certain area, in John's case, the villages that were in walking distance from his home. No doubt John would be found in the village market squares or carrying his goods from one farm houses or cottage to another. 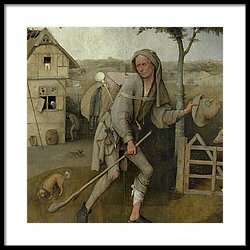 To give some idea of the life of a hawker we can look at the art work of Hieronymus Bosch's whose hawker can be seen leaving a village with its dilapidated inn and it's residence getting up to all sorts. Bosch's work is allegorical of course, and painted two centuries before my ancestor was born, but it does show what John life on the road was like and what he may have witnessed on his daily travels. Interestingly, the hawker in the Middle Ages was seen as a two sided figure. One side of him is associated with sin, and the other a sinner repented, perhaps that is why Bosch's hawker is wearing two different shoes. ​In the late spring of 1866, John may have arrived home from his travels to find that Elizabeth was ill and sitting in her chair, her lace making equipment laid to one side, maybe a doctor was called we don’t know but what we do know is that after forty-four years of marriage and at the age of sixty eight, Elizabeth was dead. For five years, John continued as he had always done, selling his pots and pans. Perhaps he gained some comfort from meeting and talking with people, but by the time he had arrived in his seventy-first year, he may have noticed that the old ways of trading were disappearing. The Toon’s may not have heard of Richard Trevithick, a Cornishman who is credited with the invention of the threshing machine that would affect the life of the farm labourer or his steam engine that would play an important part in the new rail system that was appearing around the country. This new way of life would not affect John, for change takes a long time, but it would directly affect his family. This engine and the train itself would prove critical to the success of the Industrial Revolution but for men like John it would see the end of his form of employment. Eventually hawking would be replaced with street or market stalls selling their wares from a permanent base, many of their customers staying in the old coach houses and the new commercial hotels that had been built to house travellers and businessmen. What the industrial revolution took with one hand it gave back with another. William, one of John’s twin sons worked alongside his father, but by 1860 he had a pregnant wife and three small children to feed. William was the first of the Toon to descend into the dark depths of the coal mines. John’s other sons would follow, but they would move to to find work in the new seams opening up in Nottinghamshire and Yorkshire. John’s daughter too would marry and leave Leicestershire for Nottingham. In John last year of life, Queen Victoria had been on the throne for thirty-nine years, we can only wonder if during those years he talked about or even heard of the war in the Crimea or the state the queen was in following the death of Prince Albert, probably not. John’s thoughts were focused on his own life and the struggle to make ends meet. Eventually though, time caught up with him, John Toon died in the summer of 1876 aged 72, he is buried in the churchyard of St George's Swannington, that was built in 1825 on a site, it is said that was chosen by William Wordsworth. Johns headstone was one among others that lined the church path and when I visited it was hidden by a large bush, when I visited again, this time taking my camera along, the marker that showed people he existed was gone.